Family and friends are invited to attend Visiting Hours on Thursday, February 7th from 4:00 pm. to 7:00 pm., in the Vertuccio and Smith, Home for Funerals, 773 Broadway (Route 107) Revere for Thomas Bernard McAveeney, who passed away Saturday, February 2nd, surrounded by his family at 87 years. A Funeral Service will be conducted in the funeral home on Friday, February 8th at 11:00 a.m. Entombment will follow at the Holy Cross Cemetery Mausoleum, Malden. Tom was the son of the late Betty and John McAveeney of Campton, N.H. He served in the Artillery unit of the Army of the United States from June 21, 1954-June 20, 1956; received a B.S. in Chemical Engineering at the University of N.H. in 1953 and a M.S. in Engineering Science at Rensselaer Polytechnic Institute in 1960. He retired after 41 years with the Johnson O’Connor Research Foundation, a national aptitude testing and research organization where he was the President from 1993-2003. 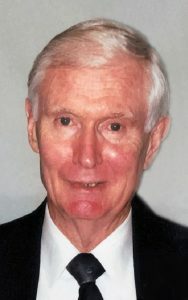 He enjoyed ballroom dancing with his wife Marie; teaching his daughters to dance, ski and play tennis; spending time with his grandchildren; and always looking to learn something new. He is the beloved husband of 44 years to Marie (Botticelli) McAveeney. Cherished father of Kimberley McAveeney of Mansfield, Donna Mascioli & her husband Carl of Framingham & Woodrow “Woody” O’Dell, Jr. & his wife Cathy of Leesburg, FL. Cherished grandfather of Alexandra, Alyssa, Madison, Nicholas, Andrew, & Michael Krysko, Justin, Kyle, Kaleigh, Nicole, & Connor Mascioli. Dear brother of John McAveeney, Jr. & his wife Maureen of VT, Ann Marr & her late husband Warren of Nashua, Sheila Doherty & her husband Dana of MN, Francis McAveeney & his wife Janet of Tewksbury, David McAveeney & his wife Janet of Gloucester. He is also lovingly survived by his brother-in-law, Joseph Botticelli and his wife Linda of Saugus & many loving nieces, nephews and extended family. Thursday, February 7th from 4:00 p.m. to 7:00 p.m. In lieu of flowers, remembrances may be made to the Kaplan Family Hospice House (Care Dimensions), 75 Sylvan St., Suite B-102, Danvers, MA 01923. My deepest condolences to Alyssa and her family at this sad time. We were so saddened by the news of Uncle Tom’s passing. Our prayers are with you all. May the memories you have of him stay strong in your hearts forever.